While looking at the Egg Chair it is really hard to believe that its design is almost 60 years old. Over the course of 6 decades, the chair has neither aged nor become trite. It still looks fresh and futuristic. Its design was conceived by a Danish architect and designer, Arne Jacobsen, who is also responsible for many other iconic furniture designs. The Egg Chair was developed in 1958, along with the Swan Chair, in order to furnish the lobby of the Radisson Blu Royal Hotel in Copenhagen. The entire building, together with its interior and furnishings, was designed by Arne Jacobsen for the Scandinavian Airline System (SAS). While working on the project of the hotel, Jacobsen, who had worked as a landscape architect in the past, pursued a "modern garden" theme. That explains the organic, oval shape of the chair, which was meant to match the concept of the building. The Egg Chair is still commercially available and it is manufactured under the Republic of Fritz Hansen brand. This Danish furniture company began its collaboration with Arne Jacobsen in 1934. Since then, Jacobsen provided the company with many memorable furniture designs, including the following: the Ant, the Series 7, the Grand Prix, the Swan and of course the iconic Egg. Although many people would certainly engage in polemics with the arguable appeal of the hotel as the structure itself, the design of the Egg Chair does not leave any room for such a discussion. With its oval futuristic shape, the chair has a guaranteed leading place in the list of the most iconic furniture designs of the 20th century. Rumor has it that Jacobsen drew inspiration for his creation from Eero Saarinen’s “Womb Chair”. However, upon closer inspection of the two chairs, the alleged resemblance is disputable. The form of the Egg Chair, with its famous sleek curves, has earned recognition around the world and has been praised by many design critics. The oval shell is made of a reinforced fiberglass composite that curves around the person sitting in it, giving the chair its famous cozy, intimate feel. The shell is padded with a cold-cured foam, which is a little thicker in the area of the headrest, in order to increase the comfort provided by the chair. It is upholstered with either wide variety of fabrics or leather. The frontal part of the upholstery is glued to the chair’s cushioning in order to reduce the amount of stitching, folds and wrinkles. The rear part is tightly pulled against the shell, which stretches the fabric (or leather) making it look very smooth. In the case of the leather variant, the considerable size of the Egg Chair necessitates the use of two cowhides, which have to be sutured together on the sides of the chair. The type of stitching used in production of the leather Egg Chair makes the seaming line wavy in appearance, which is very distinctive for this design. The first models of the Egg Chair did not have a sit pad, that feature was added later in order to make the chair more comfortable. The Egg stands on a four-leg base and swivels at the whim of its owner. The base is made of buffed aluminium mounted on a satin-polished steel pedestal. A serial number is engraved on one of the prongs, which proves the authenticity of the chair. Over the course of the Egg’s production, some of the chairs were equipped with the reclining mechanism with the steel handle sticking out of the side of the chair. It is used to adjust the amount of pressure needed to make the chair lean backwards. Summarizing, the Egg Chair is a truly iconic piece of furniture, which never ceases to amuse. Its cutting-edge futuristic design, combined with the impeccable quality of craftsmanship, has earned the chair a very special place in the interior design history. 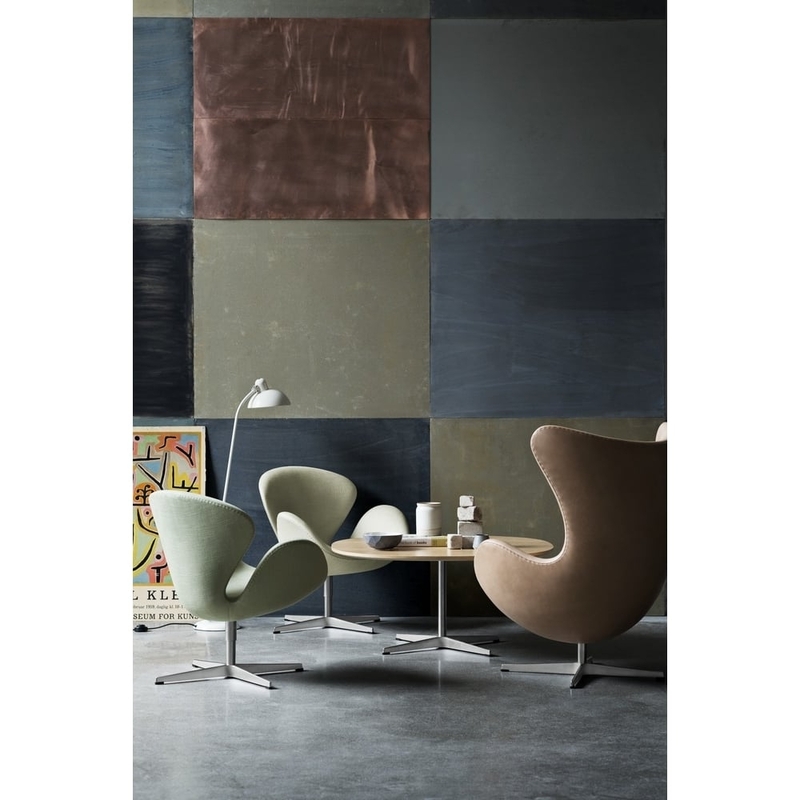 In 2008, a series of 999 limited edition chairs was manufactured by Fritz Hansen to celebrate the 50th anniversary of the Egg. The special edition chair was upholstered in brown leather and suede, and stood on the bronze, satin base. In order to reach the absolute heights of comfort and relaxation, customers can combine the Egg Chair with the matching foot stool. In 2007, the fast food chain McDonald’s refurbished a number of its restaurants in New York, London and Copenhagen with new furniture, including the Egg Chair, in order to give those restaurants a more sophisticated and elegant feel. The chair can be seen in a multitude of cinematic productions, including the following: Ugly Betty, Lucky Number Slevin, Austin Powers, Zoolander and A Space Odyssey.